If baseball is the great American pastime, camping is definitely part of the great American summer vacation tradition. Whether you’re road tripping in your RV or thru-hiking those rugged trails, there’s a place for everyone to set up shop, build a s’more and spend an evening gazing at the stars in the dark night sky. There are all sorts of campsites for all kinds of campers in all sorts of spots across the country. There are ones close enough for takeaway delivery and those far enough away that you’ll never see another human your entire stay. They exist for climbers and mountain lovers, ocean fans and desert fanatics, novice and experienced hikers and everyone in between. There are family friendly spots and pet friendly ones, sites set up for first time campers and ones frequently visited by camping veterans. You can hike there by trail, ferry your way in or drive right on up - whatever your pleasure.Camping is a fantastic way to spend a night or an entire vacation. Whether you’re looking for a 24-hour period to recharge your batteries, setting up shop for a two-week stay or you’re passing through for a few nights on your way from someplace to somewhere, the camping world has a place for you. Some choose to bring their house along in the likes of an RV or camper van. Some choose to carry in the packs on their back everything they think they need. Some choose to ditch the mainland and take a boat ride miles offshore to reach their desired spot. Some drive their car up to the spot and set up their tents in the adjacent site. Regardless of the type of camper you are and the type of camping you wish to experience, the country’s national and state parks are waiting for you. Slather that sunscreen, spray on that bug spray, grab your sleeping bag and get out there! Camping is an available option for all sorts of travelers. If it’s something you choose to do yourself, it’s possible. If you’re looking for established cabins where you can show up and leave with little effort, it’s possible. 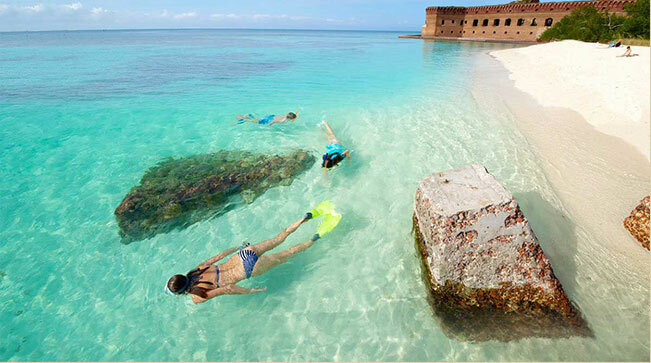 If you want to ride in and ride out by your own mode of transportation or with the assistance of a ferry (like the Yankee Freedom III in Dry Tortugas National Park), it’s possible. There are campsites with grills and those that allow you to build your own fire. There are campsites that get you close to wildlife and ones that keep you at arm’s reach. There are those that allow you the creature comforts of nearby cities and those that allow you to be so remote that your mobile phone refuses to work. For families or those looking to travel in large groups, camping is a great way to lessen the cost of those expensive hotel rooms. For those who enjoy cooking over an open fire, sleeping amidst the outdoors and having nature at your fingertips, camping is a fabulous holiday choice. There are as many ways to camp as you can possibly imagine. For those who want to carry their belongings, there are always the options of a camper van or RV. First time travelers or those not yet ready to purchase might look to rent one and test the experience on the road. Your local outdoor stores (the likes of REI and EMS), camping stores (like Coleman) or countless websites (like those dedicated to national parks and their access) can help you in your planning, purchasing and packing stages. Researching types of tents, cutlery, crockery, sleeping bags, hiking shoes, trekking poles, camping stoves and extras, and the best sites for your needs are all part of the learning and camping process. Check with friends who have experience and see if you can tag along with them for your first time out. Find your preferred source for factual information of the great outdoors and subscribe away. Pack your necessities; plan for a few what ifs along the way, don’t forget the first aid kit, sunscreen and bug spray and head on out for your natural vacation experience. Incredible landscapes await - you don’t want to keep them waiting. No matter how far from home you’d like to roam, there’s a spot for you. There’s a park for you that’s close to home or far away and with accommodations or without. Looking to be seaside like in Maine’s Acadia or boulder in the desert like in California’s Joshua Tree? Want to float amidst the islands like at Key West, Florida’s Dry Tortugas or hike amidst the mountains like in Montana’s Glacier? Going in search of your first lava experience like at Hawaii’s Hawaii Volcanoes or diving into the crevasses like in Arizona’s Grand Canyon? Figure out your preferred distance, throw a dart at a map or find where your friends have discovered their favorites. Return to the same spot annually or pick a new one for each adventure. There’s an endless supply of camping spaces in the United States; we couldn’t possibly list them all. For some fan favorites, check out our suggestions. For further details, check out the National Parks website and those of your requested state parks. Channel your passion, find your campsite and head on out there - nature awaits your arrival.